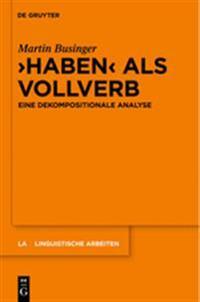 This monograph on the verb have in the function of a full verb asserts that have-constructions in the syntactic analysis are to be placed in relationship with absolute with-constructions (cf. Mit den Fussen auf dem Tisch erwarte ich meine Schwiegereltern Literal translation: With my feet on the table I expect my parents-in-law]). Furthermore, the study also contributes to a better understanding of the syntax and semantics of adjectives. The findings are interpreted within the context of generative and optimal theoretical models."